I recently found at a flea market in a nearby village an absorbing account of a Scottish legend. The Big Grey Man of Ben Macdhui by Affleck Gray (Aberdeen: Impulse Books, 1970) collates accounts of strange experiences on the slopes or summit of the second highest mountain in Britain. These tend to resolve into three sorts of encounter: hearing unexplained footsteps; seeing a very tall figure; and feeling an overwhelming sense of dread. Affleck Gray’s book is an important study of the matter. However, it is chiefly arranged thematically by the type of experience reported, and also includes similar material from further afield. It also, in aiming to be comprehensive, does not distinguish between the differing qualities of the accounts. There is some evidence, as Gray shows, of earlier folk-lore about a figure on the mountain, known in Gaelic as Am Fear Liath Mòr, but the first recorded account of the specific type of experience was given in 1925 by Professor Norman Collie, a distinguished scientist and climber. He was recalling what had happened to him some 34 years earlier: and it is a feature of many of the accounts that they are only told many years later. The chronology I have compiled below lists encounters and reports in date order and includes only those in or near the Cairngorms, chiefly on Ben Macdhui itself. Only first hand accounts from named individuals are included. 1891 Professor Norman Collie, alone on Ben Macdhui, experiences a “crunch, crunch” sound behind him, not his own footsteps, and is “seized with terror”. 1925 Collie tells his experience to the AGM of the Cairngorm Club (November) and it is reported in the local press. The Aberdeen Press and Journal subsequently (December) publishes responses, including from Forbes (above), some sceptical, others offering explanations or similar experiences. 1943 Alexander Tewnion, mountaineer and naturalist, hears footsteps and sees “a strange shape”. He fires at it with his revolver. He recounts his experience in The Scotsman (June 1958). 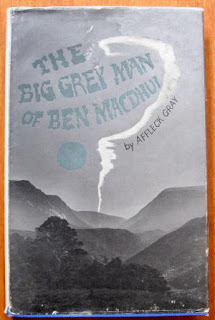 The figure of the Big Grey Man has been linked, especially in studies of the paranormal, to similar unknown mountain humanoids elsewhere in the world, such as the Yeti. On the other hand, an explanation has been suggested relating to the natural phenomenon of the Brocken Spectre. But this survey of the first hand accounts shows that most of the reports are not predominantly visual: it is the footsteps and strong feeling of trepidation that are most to the fore. The subtlety of the haunting and the effect on the protagonist, a strong sense of inexplicable dread, place the accounts in similar terrain to the literary ghost story. I remember borrowing this book from Whitby Library and reading it avidly many years ago. There was a book about Sawney Bean that I got out at the same time. Scary stuff.